Leveraging SEO (Search Engine Optimization) is a quick and easy way to boost your content on search engine rankings. Often, SEO can be a missed opportunity for organizations to revamp their digital strategy and refocus quality content with maximum return. We break down some simple solutions to ensure higher SEO rankings with the basic guidelines below. Key content should be at the top of the page, particularly in your headings. Search engines expect content to be indexed according to heading size and order, so utilizing correct headings is a must. 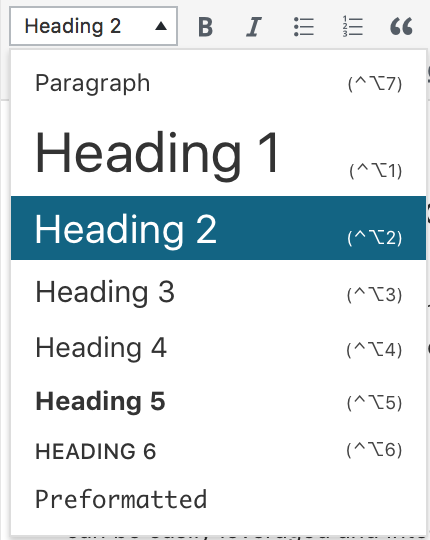 Since your title is Heading 1 (H1), you should begin ordering your content with subtitles in Heading 2 (H2). Sub points should work their way down the list with H3, H4, etc. Check out this helpful breakdown of why headings work for SEO ranking from Yoast. Headings should be formatted to maximize SEO capabilities for your website. Links are vital for maintaining high SEO ranking. While there are entire fields of study on how to utilize links most effectively, the basics consist of understanding different types of links and how they can be leveraged effectively within the science of a search engine. Internal links drive users back into your site, whether it’s relevant blog posts, pages, or other resources like white papers or case studies. External links point to third-party sites that add credibility and relevancy to the topic. The goal in using external links is much like engaging followers on social media: if used correctly, and if the content you have published is viable, then those third party sites will link back to your material, thus boosting your rankings. Internal links are used to keep bounce rate low, meaning that users aren’t exiting from the page without looking at other content on your site. There are untold numbers of resources available to help you maximize the potential of links included in your content. Check out BackLinko’s definitive guide or Moz’s helpful guide for beginners to learn more about link building best practices. Images can be tricky because they serve an immense purpose in driving traffic but have no text to help rank on search engines. Therefore, alt text should be used on every image throughout the site. 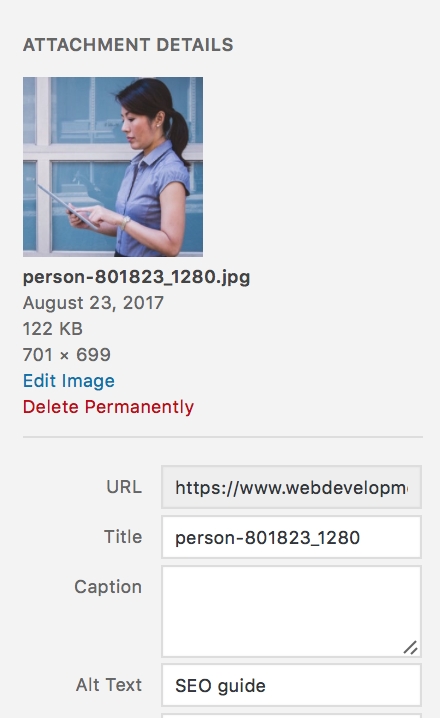 Alt text is a short description that allows you to attribute specific text to your image, thereby adding to the search engine’s ability to find and rank an image as content. Essentially, alt text allows you to provide emphasized content as another resource for ranking. There are many great resources available online for users to learn how to write alt text, like this one from Moz. Alt text is designed to help provide context for images on search engines like Google. Meta descriptions is absolutely crucial in raising SEO rankings. Search crawlers use metadata to summarize and rank your content for users. The meta description is not part of page content, but rather a chance for you to reinforce target keywords and provide a description for users to entice clicks. 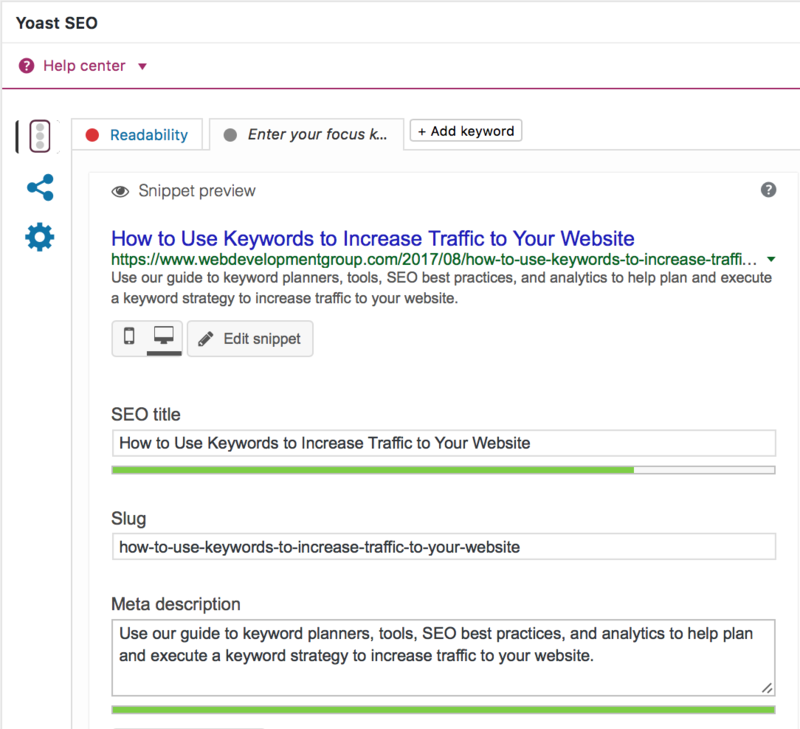 Built in tools like Yoast easily allow you to measure the applicability of your meta description by indicating the ideal length for your SEO title, slug, and meta description. Use Yoast SEO or other helpful tools to help you craft SEO-friendly meta descriptions with keywords to raise your search engine rankings. Keywords are vital in providing the ideal content for high search engine rankings. Remember that content should be audience-focused, and therefore keywords used in an appropriate manner. You don’t want to oversaturate your content with keyword-stuffing, meaning you should focus on one-to-three (at most) keywords which should appear in strategized sections of the page. Short versus long tail keywords are often a source of debate for content creators. Short tail keywords are the most commonly used type of keywords, meaning broad audiences of potential users are searching for these terms; however, this also means the competition to rank with these keywords can be quite high. Long tail keywords add specificity by using three to five words, increasing the chances of getting ranked because the competition is much lower. The downside is, of course, that with lower competition there are less searches performed for those keywords. When choosing between the two, analyzing target audiences and return on potential rankings will help you make an informed decision. Remember that the goal, whichever you choose, is to maximize the likelihood of ranking high for your particular business niche. Helpful guides found online can easily help you break down the metrics and potential return on short versus long tail keywords. Short tail keywords and long tail keywords provide different capabilities for your search engine ranking. Page title and at least one or two headlines are high on the list of places where keywords should appear. Meta description is also an important keyword opportunity, as well as the slug for the URL. Lower-priority areas for keywords include image alt text or other emphasized content, as well as external links related to the keyword. Keyword planners like these from Google, SEObook, and Moz are helpful resources when analyzing potential areas for maximum return on keyword investment. Whatever your keyword strategy, remember also that you should follow website best practices in order to gain a foothold on Google, Bing, or whichever search engine you may use. These include making sure your website is secure, mobile responsive, highly performant, designed with a easily-usable UX in mind, etc. By leveraging the basics in SEO best practices in addition, you will be able to gain higher rankings in search engines and optimize your content for maximum audience engagement. Encourage users to click on your content by reinforcing the use of opportune areas to incorporate keywords, alt text, meta descriptions, and more. These easy solutions require a little effort, but provide immense return on the investment in your time with improved search rankings and increased engagement with your site. Want some helpful tools to grade your own site? Want to learn more about how to leverage tools like these for increased SEO rankings? Speak to expert digital strategy team or email us at [email protected].